What I did like: I really like the concept. I liked that I had the option of wearing them pushed up or down, and that they could go over my wrists to cover that annoying drafty spot. I actually like that they have such bright colors and patterns. I wish I dressed more like that! I liked being able to take them off and tuck them into a pocket of the side pouch of my pack when I got warmer. 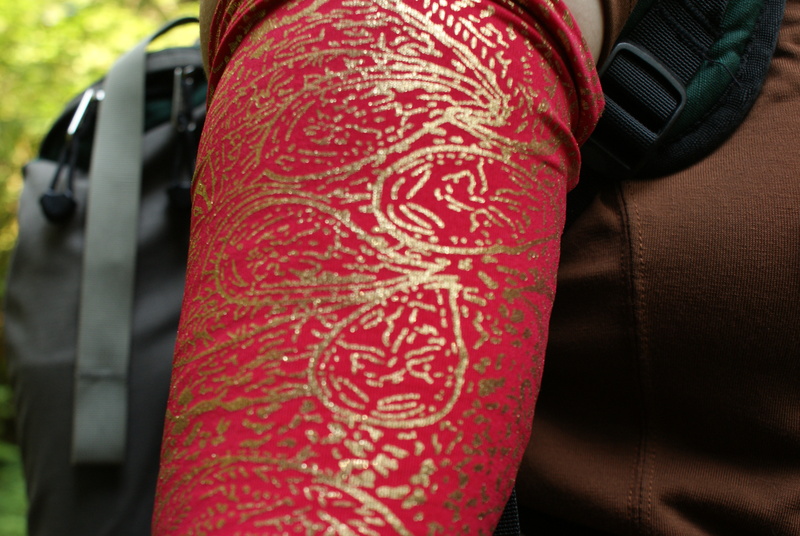 They did stay in place on my arm, and they seem to be well made. They have a little pocket just big enough for a key and credit card or driver’s license, in case you stop somewhere on your run. I like that I could basically have both a long- and short-sleeved shirt on at the same time, and can go between them as needed. They pack down really small, and hardly weigh anything. The conclusion: I do recommend these for outdoorsy types. I look forward to trying them in more situations. I could see myself using them for gardening, bicycling, going to the park, or even just being a tourist. Maybe I’ll even get myself a shirt that matches! They cost $19.50 per pair, and you can go to their website, http://www.wildskinsco.com to see all the great colors and designs that are currently in stock. 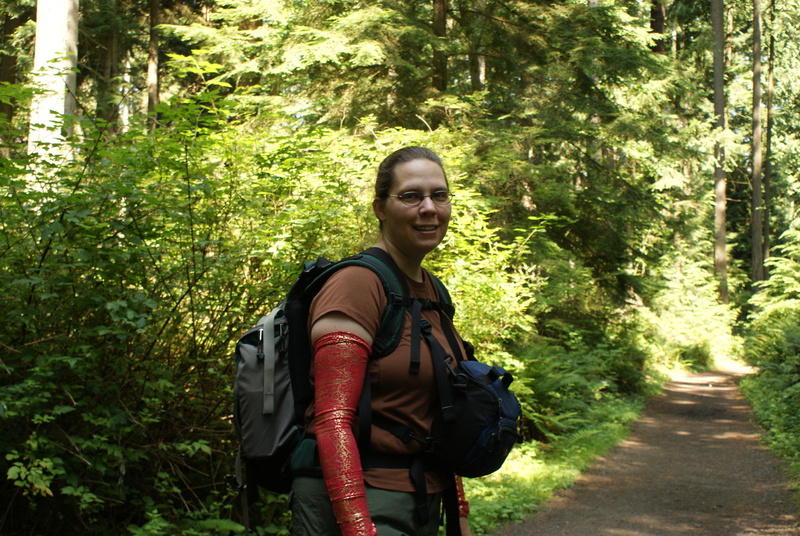 Many thanks to Wildskins for letting me try these fun arm warmers! Disclaimer: I received a pair of these for free to review. All opinions are my own independent thoughts. What a great concept! I think my husband would be a great candidate for these. He has vitiligo, which has taken most of his pigment and has made him defenseless against the sun. He doesn’t like wearing clothes that makes him too hot, but if he’s going to be in the sun he has to keep those arms covered. Where he could use these most is on road trips. His window-side arm and wrist is always exposed to the sun while we drive. He usually throws a towel over it, but that’s not always very effective. I can also see it being very useful when hiking on the more wild trails where you’re brushing up against the plant life quite a bit. These can protect you from thorns, branches, and plants like stinging nettle and poisonous oak that can cause a rash. I bought a similar product at Costco about a month ago for $15. I have used them several times and I really like them. Mine are white and cover my entire arm. I love them!